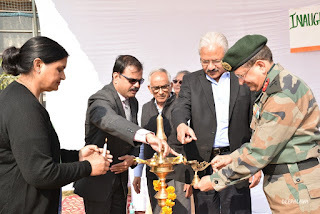 New Delhi, December 14th 2018: The newly formed National Cadet Corps (NCC) Unit of Deepalaya School, Kalkaji Extension was inaugurated today. Chief Guest, Maj. Gen. Ajay Seth, Additional Director General, NCC launched the unit by handing over the NCC flag to the head boy of the NCC Unit of the school. The programme began with the traditional lighting of the lamp, a prayer song by the students and a formal welcome by Mr. A. J. Philip, Secretary and Chief Executive, Deepalaya and Manager of the school. Thereafter, the school flag was hoisted by the Chief Guest. In his address to the audience, Maj. Gen. Ajay Seth urged the students of the school to follow the noble values of “discipline” and “unity” in their everyday lives and contribute towards nation building. He mentioned that students are the leaders of tomorrow, and should be introduced to the concepts of patriotism and community service at an early age. He also lauded the noble efforts of Deepalaya towards the eradication of illiteracy in our country. Also present on the occasion were Mr. T.M. Abraham, Founder-member and Chairman, DSKE; Ms. Vasantha Kutty, Director Education, SKE; Col. SVS Yadav; Group Capt. TSS Krishna and a few other Army officials from senior ranks of the NCC. To do away with monotony of the programme, students of the school also presented a dance and song performances. The student cadets of the NCC Unit energized the atmosphere by conducting a march past in the school grounds. The ceremony ended with a vote of thanks by Mr. C. P Davis, Principal, DSKE and the national anthem. Deepalaya School, Kalkaji Extension is a co-educational, senior secondary school affiliated to the Central Board of Secondary Education. It got recognition from the Directorate of Education in October 2008, and was upgraded to Senior Secondary level (in Arts & Commerce stream) during 2013. The school provides quality-oriented, value-based education to underprivileged children mostly from the neighbourhood communities in and around Transit Camp Kalkaji, and provides opportunities for all pupils to learn, grow, and to become contributing citizens of the nation. Deepalaya is an ISO 9001:2008 certified non-government organization that believes in enabling self-reliance and is committed to working on issues affecting the urban and rural poor, with a special focus on women and children. Wonderful report!! Enjoyed reading the excellent write-up! !